Women from across Australia will meet in Adelaide next month to be part of shaping the Church of the future. Source: ACBC Media Blog. Dr Trish Madigan OP, chair of the Council for Australian Catholic Women, said she was delighted with the early response to the "Stirring the Waters: Catholic Women Responding to the Spirit" colloquium, with registrations very strong and spaces limited. “Women from across Australia are coming together to be part of frank and open discussion, prayerful discernment and planning,” she said. Lyn Horner, from the Townsville Diocese, said she has found attending past colloquiums heartening. “I get a new energy for living the Gospel from the input and discussions, and from the example of other women,” she said. 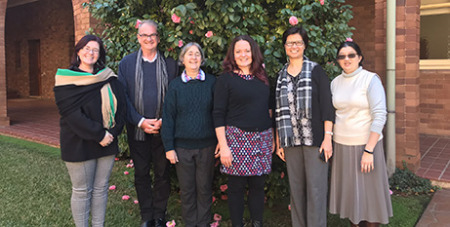 Andrea Dean, director of the Australian Catholic Bishops Conference’s Office for the Participation of Women, said the Plenary Council 2020 process appeared to be giving new heart to Catholics, including women, and would be one of a number of topics scheduled for discussion. Ms Dean said Archbishop Christopher Prowse, chairman of the Bishops Commission for Evangelisation, Laity and Ministry, would contribute to the opening session by marking the 20th anniversary of the research project “Woman and Man: One in Christ Jesus”. “Secondly, the call to be a more inclusive and synodal Church will be discussed, and ideas about how this might happen in Australia will be shared,” she said. Ms Dean said women from remote areas and from drought-affected dioceses had been sponsored to attend, ensuring a range of experiences will be represented in discussions. Early bird rates for the colloquium, to be held from February 22 to 24, are still available, but as of yesterday, only another 21 registrations could be accepted because of space constraints at the venue.